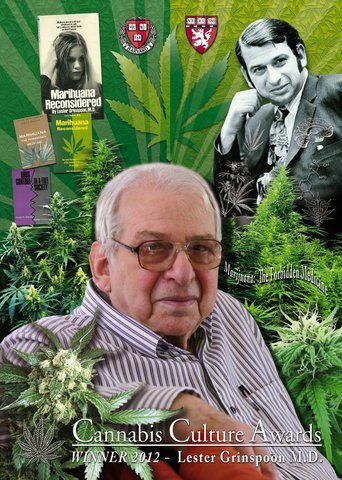 The psychiatrist Lester Grinspoon was convinced that marijuana was extremely harmful. He wanted to make the young people understand that something was forbidden. Being a doctor and professor at the Harvard University, in 1967 he was proposed to carry out a meticulous research that would allow him to demonstrate scientifically the great dangers that marijuana entailed to dissuade them from consuming it. Who would have said that he would end up being a marijuana activist! The more he investigated the more he was surprised with the very low level of marijuana's toxicity. The evidence not only did not support its initial hypothesis but, on the contrary, denied it. He could not believe how much of the population, but above all himself, with his scientific and medical training, had believed what the government said. They had managed to brainwash them with misinformation and unfounded accusations. From this research work emerged Marijuana Reconsidered, a book published in '71. In this study he concluded that marijuana for recreational use presented no real risk and the ban on this drug was totally absurd. The danger is not marijuana but the way we react to it as a society. Hundreds of thousands of people arrested every year for marijuana use were nonsense: hundreds of thousands of people and families destroyed by criminalization, coupled with hundreds of millions of dollars of public treasury that went into these operations. Also in '67, one of his sons, Danny, was diagnosed with leukemia at age 10 and chemotherapy soon started to destroy him physically and spiritually to the point of wanting to quit. At that time an oncologist told Dr. Grinspoon about the case of a teenager who, in a situation similar to that of his son, smoked marijuana before the chemo sessions and that completely nullified the nausea and vomiting. But Grinspoon declined to take the test for fear of incurring illegality. Luckily, his wife did not think the same. A few weeks later he arrived at his son's chemo session and was surprised to see him laughing and joking. Not to mention when they left: instead of vomiting and going to bed he asked his mother to go for a sandwich. In fact and with the help of his mother, Danny had smoked a few puffs of weed before the session. Lester was hallucinating with the fast-acting effect the weed had caused. This was how he gradually started to internalize himself in the medicinal properties of Cannabis and discovered its potentialities. Dr. Lester Grinspoon studied for several years the medicinal properties of marijuana and found that in several cases it heals and alleviates ailments much more effectively than any other medicine, especially in cases of pain and muscle problems. Indeed, it is considered the miracle plant of our time due to the wide range of applications it has and also due to another of the wonders of Cannabis that is, no one has ever died of overdose from marijuana, it is directly impossible due to its low toxicity. Which is not true regarding aspirins. The outlawing of marijuana at this point represents a major problem with many facets: on one hand, various patients are being denied access to a cure for their disease. Besides that, they get to resort to the pharmaceutical industry where they will leave a bundle and possibly give them a medication less effective and with side effects. But the most cruel thing is that the one who decides to consume marijuana for his illness is exposed to a double anxiety: the one that creates his illness and the other of doing something illegal, reason why could go to prison. For several decades Lester has been a well-known activist of marijuana legalization and author of more than a dozen books on the subject. The most recognized is the one he published in '93 with James Bakalar: Marijuana, the prohibited medicine. As part of its activities it carries the RxMarijuana blog, where there are questions and answers about the medicinal uses of marijuana, and an extensive collection of anecdotes about the subject. In recent years, marijuana as a medicinal drug has gaining a lot of space and there are companies in the United States and in Great Britain that make pills like Marinol and Sativex. The first is basically synthetic THC, imitating one of the active principles of marijuana and the second claims to have all the properties of marijuana but without the high or the respiratory consequences of smoking. On the one hand, cannabis can be inhaled with a vaporizer which eliminates the inhalation of smoke and its risks to the lungs. But above all, it is the set of components that makes this plant wonderful, and the place itself is part of the medicinal aspect, among other things because it relaxes and removes anxiety. On the other hand, none of the synthetic drugs produced provides the same effect as that obtained from smoking marijuana; In fact most of the patients who have tried them say that it does them nothing. Smoking marijuana has an instant being much more effective than ingesting a synthetic compound orally. Besides that, these pills are very expensive. And even more if we consider that besides buying marijuana, anyone can plant their own plant. That is, drugs that carry synthetic THC have no advantage over the natural plant, except for one detail: they are legal. All this, rather than being a step forward in opening the debate on legalization, can be a step back. Since legality is the only aspect that sustains the business, it is clear that pharmacists will do everything possible to prevent legalization. And in turn, these legal medicines will serve as an excuse for the government to avoid the debate of legalization: you can say that it has been advanced at that point allowing the pills. It's a way to get rid of the problem. Hopefully in the coming years we can see more medicinal advances from marijuana, but without the pharmaceutical companies stand between patients and their medicine. The main studies being carried out at the time are related to the THC and CBD components of this plant, which depending on their levels and combination can produce more suitable effects for one or another patient. In this same line of research is working CBD Crew, where some marijuana experts such as Shantibaba or Howard Marks participate. In addition to the recreational and medicinal use of marijuana, Grinspoon highlights another valuable application, which he calls "intensification." It refers to how the mariajuana acts in perception and thought, something that took years to discover since he had never tried a joint until that experience with his son happened and was encouraged to do it. From there he discovered how marijuana opened the door to a series of sensations and perceptions that he did not normally access. On the one hand, it emphasizes the ability to understand or appreciate elements that otherwise go unnoticed. Whether you see an image in a blur, close your eyes and have a flash of images and scenes that come from the unconscious, appreciate artistic qualities that we could not see or also make connections between ideas or concepts that seemed disconnected. But above all, he is struck by this sense of unfoldment, in which we seem to be two people: the one who has access to this sensitivity and creativity, and the one who observes from the outside and is astonished by these perception. In another blog of his own he gathers different positive experiences that people have with marijuana in this sense of intensifying feelings and their creative value. If you enter the blog, you will see that there are several articles written by a certain Mr. X, which was no other than the well-known scientist Carl Sagan, Lester's close friend. It was just Sagan, a marijuana smoker from the 30s, who proposed to him on numerous occasions to try weed. Sagan collaborated closely in the writing of several of Grinspoon's best-known texts. If you want to be aware of the new opinions, concerns and discoveries of Lester Grinspoon today, in addition to looking at his blogs, you can follow him on Facebook. We also propose you to see the excellent documentary Clearing the Smoke: The Science of Cannabis. Highly recommended! Unfortunately, there is no subtitles yet available. By the way, did you know that the Barney's Farm seed bank has a sativa that they have baptized Dr. Grinspoon in honor to Lester? Photo taken from his Facebook profile. Poster of the Cannabis Culture Awards.